Potatoes came to China in the early 1600s but were not a major crop until the 1980s. By 1993, China became the world’s largest potato producer, and in 2014, it produced 96 million metric tons – twice as much as India, the second largest producing country[i]. This significant growth in potato production highlights how important potatoes have become in China. This importance is driven by income growth and rapid changes in consumer demand. Since early 2013, the Chinese government has refined their food security strategy and has been promoting potato as a new staple crop to improve food security and water shortages throughout the country[ii]. Because potatoes have a long storage life and use limited water in production, all while remaining a nutritious option, potato research is now a priority. As part of the Chinese potato breeding program, several varieties have been produced to increase potato yield while reducing the impact of main biotic constraints in potato production – the most important being late blight. One of those varieties is Cooperation-88 (C88) which was developed through a collaboration between the International Potato Center (CIP) and Yunnan Normal University (YNU), with the goal of breeding a high quality, late blight resistant variety that tastes good[iii]. In 1996, C88 was named and released as a cultivar. By 2009, it covered 186,667 hectares and was the most widely grown variety in Yunnan[iii]. C88 is now grown in four provinces: Yunnan, Sichuan, Guizghou, and Guanshi. It is evident from the high adoption rates that C88 has made an economic impact. The variety is expected to benefit adopting farmers in the form of higher yield (due to its late blight resistance property) and price, which in turn should increase farm income and household food security. 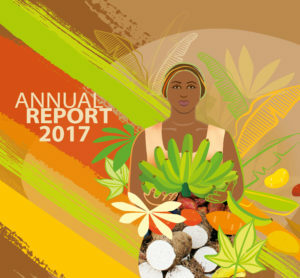 To measure the impact of C88, a collaborative effort funded by the Standing Panel on Impact Assessment with additional funding from The CGIAR Research Program on Roots, Tubers and Bananas (RTB), was undertaken by CIP, Virginia Tech (VT), and YNU. Previous studies estimated the adoption of C88 but none rigorously quantified the impact. The study objectives are to verify previous adoption estimates of C88 in Yunnan, and determine the economic benefits C88 has had on consumers and producers in China. 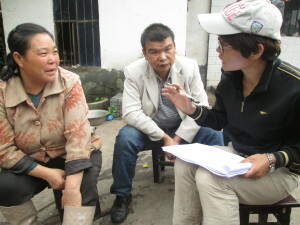 A random household and a community survey conducted in Yunnan were used to gather information about potato production. The purpose of the household survey was to collect information on potato production and demographic and socioeconomic characteristics of potato-producing households. The community survey was used to verify the data from the household survey at the village level and to estimate the yields and cost of production for C88 compared to alternative potato varieties. An enumerator surveys a local potato farmer for the project. From July to early September 2015, a research team from YNU, CIP and VT interviewed 616 farmers in 41 villages. Interviews with value chain actors, such as potato chip processors and wholesalers, were also conducted. When finished, this project will paint a picture of potato farmers in Yunnan and what influences their decisions to adopt potato varieties. This will inform researchers such that new varieties that meet producer needs can be developed and disseminated more efficiently. The more qualitative results from the value-chain study will also provide feedback to potato researchers and policy makers on constraints faced by farmers in C88’s value-chain. A major constraint to the adoption of C88 that the survey uncovered is a lack of seed markets. Many farmers grow one variety until another is introduced. They do not generally purchase new seeds of the same variety. Instead, they completely replace one variety for another. As seed quality degrades, production suffers because quality seed potatoes are not available. Farmers preferred C88 because of its high yield and high quality, which leads them to receive a higher price. While C88 has many positive traits, the two major problems reported by farmers were decreasing yields as the seed stock ages and late maturity. Although C88 is late blight resistant, it is still affected by late blight because it matures later than other varieties and may still be in the fields as moisture appears. Farmers are beginning to replace C88 with varieties that mature earlier because late blight does not become a major concern until later in the season. However, potato processors value C88 tubers and recognize the importance of the variety to the rapidly expanding processed chip industry. C88’s value-chain is comprised of two main markets: chip processing and fresh consumption. Medium-sized tubers go to chip processors who prefer C88 over most varieties due to its low water content, high starch, and medium sized tubers. One chip processor reported a shortage of C88 and thus, the need to resort to another variety to supplement his processing business. Larger tubers are destined to the fresh market, and mainly found in large restaurants, such as those in hotels; savvy consumers prefer C88’s taste and quality. The next steps are to analyze the household and community data to supplement the qualitative findings. This will allow researchers to determine the adoption rate of C88 in Yunnan Province, identifying factors that affect farmers’ adoption decision of C88, and estimating the economic impact of C88 in China. The various research methods, mentioned above, will provide feedback to researchers on the importance of potato research to China and C88’s impact on farmers, consumers, and China. China is also set to host the first World Congress on Root and Tuber Crops, due to take place in Nanning, Guangxi province from 18 – 22 January 2016. The Congress will bring together the world’s foremost experts in the field to share advice, review scientific progress, and identify and set priorities for future research, along with raising awareness of the global importance of root and tuber crops like potato. This blog was contributed by Stephanie Myrick, Jeffrey Alwang and Catherine Larochelle from Virginia Tech, and Guy Hareau and Willy Pradel from the International Potato Center. [i] FAOSTAT. (2015). Top 20 Commodities by Country. [ii] China Daily. (2015, January 8). Potato upgraded as new staple crop. [iii] Li, C., Wang, J., Chien, D. H., Chujoy, E., Song, B., & VanderZaag, P. (2011). Cooperation-88: A High Yielding, Multi-Purpose, Late Blight Resistant Cultivar Growing in Southwest China. American Journal of Potato Research. This entry was posted in News, News & Events and tagged breeding, China, CIP, partnerships, potato, seed degeneration, seed systems, value chains, virus on Jan 14, 2016 by RTB.